Gunnison Pioneer Museum Stories | Do you know what this is? If you have seen it and know how it was used, YOU COULD ALMOST BE CALLED A PIONEER! If you have no idea what it is, YOU WERE BORN AFTER 1955 OR YOU ARE A CITY SLICKER! The answer is a MILK SEPERATOR. My article this week is about the Gray House and what is in it. The Gray House was donated in 1993 to the museum by Gale and Dodie Meldrum, it was located behind the Western Motel and Restaurant that was owned by the Meldrum. The Gray House was built in the 1920’s. The house was named after an early day’s occupant of the home, Homer Gray a civil engineer and his wife Mary, who was the sister of Rial Lake. The Lake family were early residents of Gunnison. When the Pioneer Museum received the house in 1993, it was converted to look somewhat like a late 1880’s to 1910 type home. All evidence of plumbing and electricity were removed. Most of the items in the house where donated by Gunnison pioneer families. 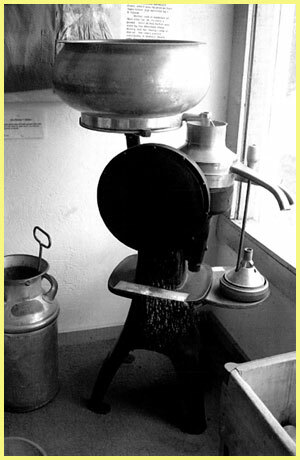 The milk separator shown above was used to separating the cream from the milk, which was used to make butter and cream products. It is a McCromick Deering brand made my International Harvester. The first Separators were hand cranked and in later years they were made with an electric motor to run them with. Jim and Ruth Stell donated this separator. All of the items in the Gray House were in use and should be familiar to most of us that were born before 1950. In the late 1800’s and early 1900’s homes were built with a kitchen, dining room, living room and bed rooms which most didn’t have closets to hang clothes in. The lighting for these homes were Oil Lamps. An example of these oil lamps that we have was donated by Zelda Rouillard. It has a clear glass top with beads at the top of glass chimney, the base is made of brass with “Eagle; Made in U.S.A. In the kitchen there is a kitchen coal and wood burning stove. It is a “Round Oak Chief” stove with a warming shelf. There are several cast iron cooking equipment such as pancake pan, Waffle iron and pots. Also there is upright toaster and Coffee pot. The wood stove poker, shaker and two clinker shakers made by Fred A. Gray and donated by Martha Gray Carr. The table in the kitchen has a red and white table cloth with several items on it. These items include a Cherry Pitter, several cook books, large Cracker Tin donated by Loret Grosland. Four porcelain plates, green crockery pitcher with Dutch scene, homemade floor scoop, wooden salad fork and a table mounted nut cracker are all on the kitchen table. There is a white kitchen cabinet with a white porcelain pitcher and wash basin on the top shelf, all donated by Bill Ender was handed down to bill by his mother Lena Lightly Ender. On next shelf there is a large white bread making bowl with the flour bin below it. In the kitchen there is a round tea can, Mountain Glory Brand Lard Bucket and five piece tin measuring cups. Three egg beaters, two quart measuring cups and can of instant postum and tin of Coleman’s mustard. There are five pressure cookers, three small and two large ones with four of them have the pressure gauges on the lids. All of them made by the Pressure Cooker Corp. of Denver, Colorado. The Dining Room and Living Room both are furnish with early 1800’s and 1900’s furniture. Upstairs in the first bed room there is a brass bed with two quilts, pillow covers, cloths, and a pillowcase made by Mrs. Hards Nitegown. In the third bedroom there is a trunk with a cotton bedspread laying on it, owned by Mrs. Joseph Block. There is also patchwork pillow on iron bed. The patchwork pillow was made by Elizabeth Schenker Zugelder and was donated by Frank W. Zugelder Jr. Remember everybody that is registered and attending the Gunnison County High School All Class School Reunion can visit the Gunnison Pioneer Museum with the three dollar off of the museum price of $10.00 with certificate received at registration. Good through Monday August 10, 2015. Just remember that the graduating class is the best and the most attending the Reunion. 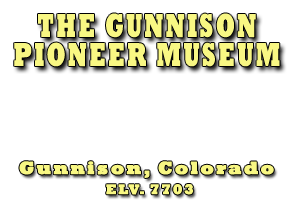 The Gunnison Pioneer Museum are always accepting new members and volunteers.